You are here: Home / REMODEL / Why Should You Invest in Kitchen Decoration? FeastHome – Kitchen is a place where theimportant actions of our home take place.It’s the true heart of the home. Kitchen decoration is the process of decorating your kitchen using some accessories or things which makeyour kitchen look more lively and beautiful. Most women tend to decorate their kitchen. Some women say“A kitchen reflects who you are and how you spend your time in the kitchen“. Decoratingyour kitchen means something different to each of us. Kitchen decorating tends to be more colour neutral. The first and foremost reason is that you would have a lively atmosphere in your kitchen. It adds a grace to your kitchen. Kitchen decoration makes your kitchen look classy. Whether you are renovating or decorating your kitchen, consider how you lived before making any changes. Investing in kitchen decoration makes your kitchen look elegant and you will hear so many great responses from your friends and relatives.If you’re a man reading this, and want to gift your wife the best gift possible, redo her kitchen. That is a great gesture that says you want her to feel great. What are some things that I can invest in? New handles and pulls: Look for some colourful options or some classic ones such as brushed nickel finish. You must avoid getting something cutesy. That will sabotage the whole look of the kitchen. Unless you want to look like a five year old doing chores, avoid it. Painting the cabinets: Buy good quality paint and paint the cabinets of your kitchen. It helps to makeyou kitchen look classier. Colours like orange and yellow look great in a kitchen, but don’t overdo it. Use small appliances as decorative accessories: A red mini fridge might catch some eyes. A cobalt toaster, a black juicer or a cherry mixer would add a new look to the kitchen. They are like jewellery to you kitchen.They are portable, so you can keep them anywhere in your kitchen. These things scream classy. Buying new plates:There’s a difference between serving a tasty food in a normal plate and a decorated plate. A beautiful and tidy melamine plate will seek the attention of your visitors. Add a little touch to your weekly dinner get-togethers. Islands or carts: For those who are unaware, these are stations where you store things needed to serve food. They are a classy way to transport food from the kitchen to the table. These aren’t a priority, but they make your work much easier. We recommend you to buy these if you have some more money to spend. We do not recommend these for tiny kitchens, but if you can find one that suits your kitchen, then great! Adding accessories: Like any outfit, a kitchen needs accessories. A bright red stool adds a fun pop of colour. You can also use hanging arts with leaning frames and pretty dishware to improve the looks of your kitchen. 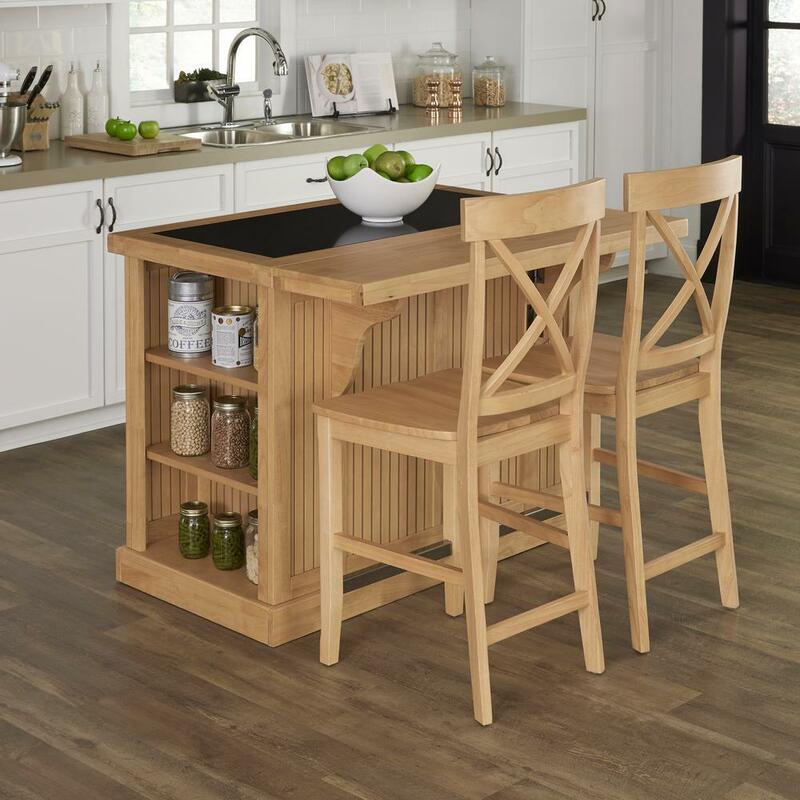 A tall table: With plenty of space, a kitchen can showcase a tall table instead of a traditional table. This will add depth to the look of a kitchen. It will help you show-off your worldly kitchen utensils. Matching rugs:Fill the floor with cosy carpets that are easy on the feet. Make sure that the colour of the rug goes well with your kitchen’s ambience. The products above help with the look of the kitchen. See below to know how to enrich the usability of the kitchen. Cutting board:Get yourself a wooden cutting board which is more gentler on blades. Don’t even think of using a cutting board made of glass. Not only is it outrageous, but it poses danger in the kitchen. Blender: The texture of smoothies and sauces made in a high quality blender is absolutely incomparable. Investing in a high powered blender should be a good idea. A bad drink made in a great kitchen just doesn’t make sense. Kitchen thermometers: You might think that a kitchen thermometer is overpriced. Using a thermometer you can easily identify whether the food is undercooked or overcooked. A great tool for new cooks. Silpat: Silpats are non-stick silicone sheets for baking. If you are very keen in baking get yourself a silpat. It helps to keep baked goods from sticking to the pan. It also prevents overcooking of baked food items. Add LED strips to shelves and under you cabinets to illuminate counter space and make them attractive. Replace incandescent light bulbs with energy efficient versions.They tend to be way brighter and cost effective. Add a mirror to kitchen wall to reflect light and making your kitchen bright. You can add additional shelving to your kitchen. Extra of shelves could be helpful. Crockery setting also influences your kitchen‘s ambience. Make sure you invest in a good one. Epoxy table tops are all the rage nowadays. Invest in one, if you can afford it. By investing in a kitchen, you are enriching the space where you make so many decisions that help you with your life. Food is a very important part of your life, and a kitchen is just as important. Make some great decisions and transform your kitchen into a talking point of the neighbourhood.